Some Iris parks feature special bridges. See below for more. It is named for a location on the Azuma River renowned in Japanese literature, where the water branched into eight channels, each with its own bridge. It is also thought that on crooked bridges one can avoid evil spirits that flow in straight lines. 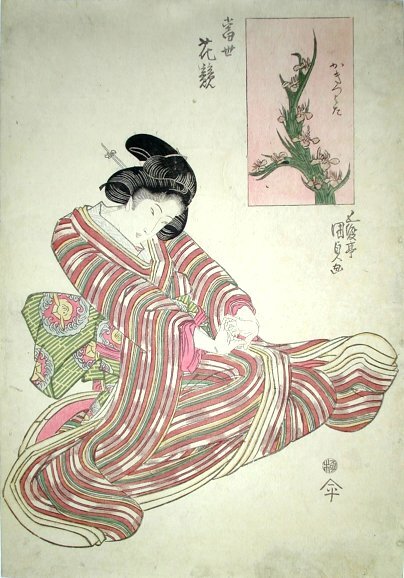 Kakitsubata on a woodblock print from Kunisada, with a fair lady. 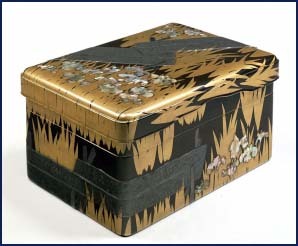 Iris and the Yatsuhashi bridge are the subject of many folding screens and other works of art. 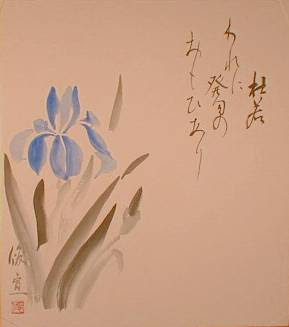 The subject of this work is drawn from the Eight Plank Bridge scene or Yatsuhashi of the Tale of Ise, and yet here both figures and the famous bridge have been eliminated, leaving only a symbolic representation of the theme in the form of a simple stand of iris. This effective handling of the classic theme reveals the painter's uniquw stance as both a decorative painter,and also an artist completely familiar with the essence of Chinese style painting. The name yatsuhashi comes from an incident in the 10th c.
in which the story's protagonist and his companions stop to rest at a famous iris marsh traversed by an eight-planked bridge. In Edo period gardens, especially those built by daimyo (大名庭園 ), yatsuhashi were often built over iris marshes in an obvious reference to Ise monogatari. A good example is found at Koishikawa Kourakuen 小石川後楽園, Tokyo. Why does Yatsuhashi have such a particular meaning? A Japanese classical masterpiece, "The tales of Ise" tells us why. A disappointed nobleman was relegated to a country in the east. On the way to his distant journey, he composed a tanka poem in which he expressed his deep sorrow of being apart far from his beautiful wife back in Kyoto with the motif of Kakitsubata and Yatsuhashi. 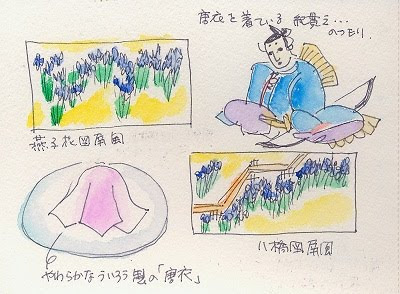 He must have longingly recalled her when he saw beautiful flowers of Kakitsubata walking along on Yatsuhashi. This sad story was much more popular than other stories in "Tales of Ise" and became the base of a Japanese Noh play entitled "Kakitsubata". One summer night, an ascetic monk, on the way to his journey to the east, met a beautiful Kakitsubata flower fairy. The fairy performed dances for the monk all the night through. The dance was so beautiful and fantastic that he could endure his loneliness. No matter what is your nationality or how old you are, missing home or people whom you love in a distant land is an universal sentiment, isn't it? 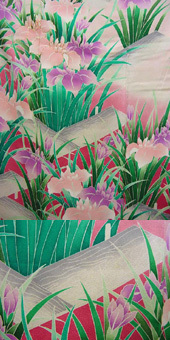 This is a great link about stories behind the patterns of Japanese kimono. Some family crests designs of this flower as base. 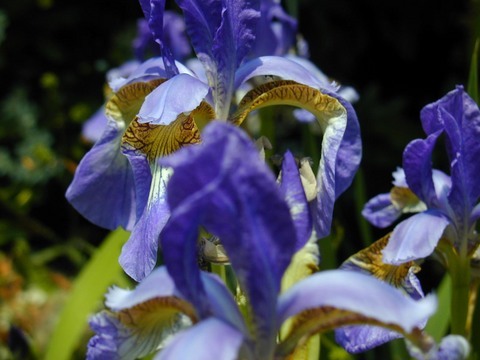 Iris (ayame) is a kigo in our database. Here is a little something special. A card game with flowers for each month. 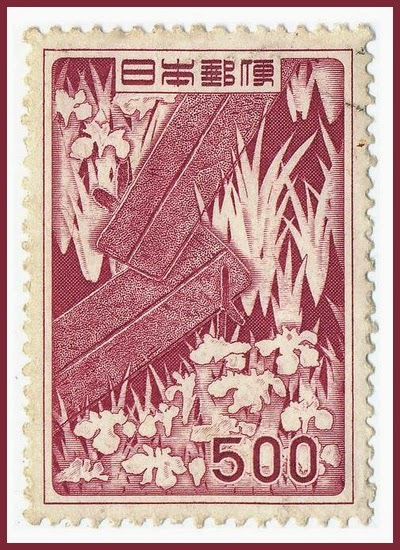 The Iris and the Yatsuhashi bridge are also featured. The cards are divided into the twelve months of the year, incorporating the kachoo fuugetsu (four beauties of nature: flowers, birds, wind, and moon). Three more haikai friends were invited apart from Basho. Ise Monogatari 伊勢物語 are all around. (Well, the kakitsubata are now in full bloom! Anyway, I will take them and write a great hokku about it. And also allude to the Ise Monogatari. "thoughts of his wife" in his mind. So I choose to translate iris in singular. The Japanese has a cut after line one. (as the translation from Barnhill might suggest), since lines 2 and 3 belong together. "Your translation is accurate for American English too. 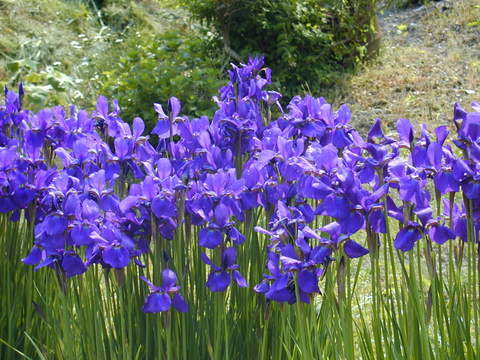 'Iris' is most often expressed in the singular unless the context is, for instance, iris species or stalks of irises. As an iris judge, this is the general parlance." Ariwara no Narihira, Ise monogatari 9.
. kakitsubata kataru mo tabi no hitotsu kana . A beautiful photo, Gabi--and a good haiga. Thanks for sharing it. Again, you make us aware of what a beautiful place you live in. haiku is just perfect for it! A lovely haiku to go with this photo Gabi. my camera is only a few months old and seeing your photographs makes me want a new one.. 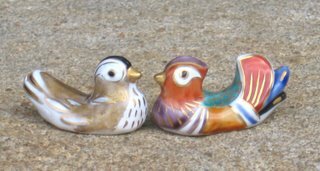 Your poem at first reading reminded me of my youth when a good friend of mine always seem to tan first in the summer and when we would stand side-by-side at the local swimming pool... we were friends of two colors! Thank you, dear Gabi san, for bringing a joyful memory. Thank you, Chibi san, for sharing this nice memory with us ! is now in our kigo database. Take a look in a leisurely moment !